Encomun is a Spanish collective of some 30 Christian communities from Madrid. Their blog is intended to serve as a virtual meting place for the communities. Intrepid translator, Joe C., has produced this English version of Part 2 of a recent article entitled WYD08 in Sydney and the parish of Redfern that the Mouse stumbled across during the week. Many thanks for your support, members of Encomun. The iconic St Vincent’s mural is under serious threat from the poor adhesion to the wall of the original painted surface beneath the mural. Unfortunately, the circumstances under which the mural were painted precluded the wall from being adequately prepared. The condition of the wall has been exacerbated by the parlous state of repair of the church’s roof, guttering and drainage allowing the ingress of water during several periods of heavy rain earlier this year, and accelerating the separation of the mural from the wall in numerous areas. The Blackfellas’ Dreaming Museum (and here) is a large and overwhelming testimony of Australian History through Aboriginal eyes. And it easily moves people. Come and join us if you can. All welcome! 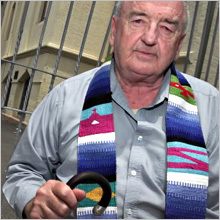 Michael Gravener is talking to Spirituality in the Pub, North Sydney at an evening devoted to Human Dignity and the Justice System on Mon Mar 19. Speaking with him is Paul Flannery former District Court Judge. Each will talk for 10-15 mins and then there will be questions and discussion. The Union Hotel, cnr Pacific Hwy and West St, North Sydney, 7.30-9.00pm. Good cheap counter meals available before the evening begins. Parking in street or at St Mary’s North Sydney. Enquiries Michelle Kamper: 9958 5963. It is time to re-issue the call to come back to St Vincent’s. Over the last few years, we at St Vincent’s have been challenged to reconsider our faith in unexpected ways ever since a gracious Cardinal recommended to an ailing Ted Kennedy that it might be time for him to retire, with an assurance that the fruits of three decades of priestly labour would be respected. On Sunday 25 July 2004 Encounter’s David Rutledge presented a program on St Vincent’s Redfern, entitled Poor Church. Encounter is a radio program that may be heard on Sundays at 7.10am (repeated Wednesday at 7.10pm) on the Australian Broadcasting Corporation’s Radio National network.